Kyle Knits - a boy, his cats and way too much yarn: Mitered Squares take Forever! 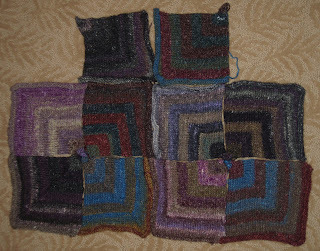 I have been working on my blanket for a week or two now - and I was anxious last night to see how the squares look when laid together. SO, I pulled the 10 that I have completed out of their respective baggies (all individually marked with the order they were created, the date and even some info on where I knit them, along with the color of yarn I used) and laid them on the bedroom floor. I am excited about the way it's looking, but it isn't what I thought it would look like... while I didn't really have any specific colorway in mind, I didn't think that the blanket would end up so random in its colorway. The good news is this: NORO is awesome. the colors all seem to work together anyway - and it's going to look amazing when I'm 75 years old and it finally gets completed. For now, I'll knit away at my little squares and be happy making the "little" projects - and later... much later... I'll focus on the second little project: assembly! I am going to make the cutoff this coming Sunday July 15th - and the following week I'll send out the emails to everyone with the info for their partners - thanks to all who joined up - it should be a fun way to force us to dig through our stashes! Hi! I just made my way over here from one of the Ravelry groups. The blanket looks awesome. Reminds me a bit of Hundertwasser designs.